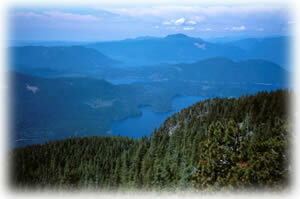 Also known as the Caren Range, Spipiyus Park is north of Halfmoon Bay on the Sechelt Peninsula. It protects pockets of old-growth forest, prime habitat for the marbled murrelet. There are hiking trails that lead to Mount Hallowell with views of the islands and fjords of Pender Harbour, the Strait of Georgia and Vancouver Island. There is a fire tower located here that has recently been restored and may be one of the only remaining ones in the province. Special Notes: Motorized access (use of vehicles, dirt bikes, snowmobiles, etc) is only allowed on the existing logging roads. 11 kilometres north of Sechelt along Highway 101, turn right onto Trout Lake Road just before you reach Halfmoon Bay. Proceed up this logging road and at the main junction at kilometre 12 take the left fork. Continue to kilometre 19.5 where the trail begins and park. Nearby communities include Sechelt and Gibsons. Conservation: This park protects old-growth Douglas-fir stands. Wildlife: Black bear, Roosevelt elk, Marbled Murrelets, various birds and other small mammals can be found in the park. Approved Purpose Statement and Zoning Plan [PDF] for Spipiyus Provincial Park is available online in pdf format. Cycling is permitted on the logging roads within the park. Bicycle helmets are mandatory in British Columbia. There are no designated hiking/walking trails. However, there are a number of deactivated logging roads suitable for hiking/walking. For your own safety and the preservation of the park, obey posted signs and keep to the main trails. Shortcutting trails destroys plant life and soil structure. Old fire lookout at Mt Hallowell is an excellent viewing area.